Integrating with System Center Operations Manager adds value to your service operations strategy by using the speed and efficiency of Azure Monitor in collecting, storing, and analyzing log data from Operations Manager. Azure Monitor log queries help correlate and work towards identifying the faults of problems and surfacing recurrences in support of your existing problem management process. The flexibility of the query engine to examine performance, event and alert data, with rich dashboards and reporting capabilities to expose this data in meaningful ways, demonstrates the strength Azure Monitor brings in complimenting Operations Manager. The agents reporting to the Operations Manager management group collect data from your servers based on the Log Analytics data sources and solutions you have enabled in your workspace. Depending on the solutions enabled, their data are either sent directly from an Operations Manager management server to the service, or because of the volume of data collected on the agent-managed system, are sent directly from the agent to a Log Analytics workspace. The management server forwards the data directly to the service; it is never written to the operational or data warehouse database. When a management server loses connectivity with Azure Monitor, it caches the data locally until communication is re-established. If the management server is offline due to planned maintenance or unplanned outage, another management server in the management group resumes connectivity with Azure Monitor. 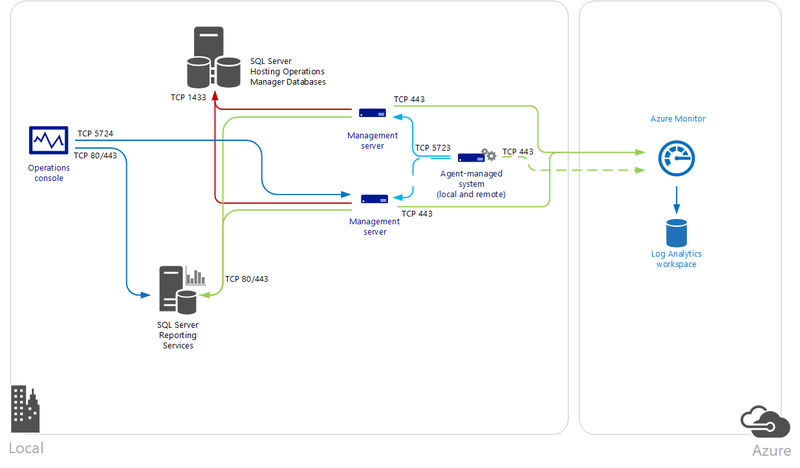 The following diagram shows the connection between the management servers and agents in a System Center Operations Manager management group and Azure Monitor, including the direction and ports. If your IT security policies do not allow computers on your network to connect to the Internet, management servers can be configured to connect to the Log Analytics gateway to receive configuration information and send collected data depending on the solutions enabled. For more information and steps on how to configure your Operations Manager management group to communicate through a Log Analytics gateway to Azure Monitor, see Connect computers to Azure Monitor using the Log Analytics gateway. Before starting, review the following requirements. Azure Monitor only supports System Center Operations Manager 2016 or later, Operations Manager 2012 SP1 UR6 or later, and Operations Manager 2012 R2 UR2 or later. 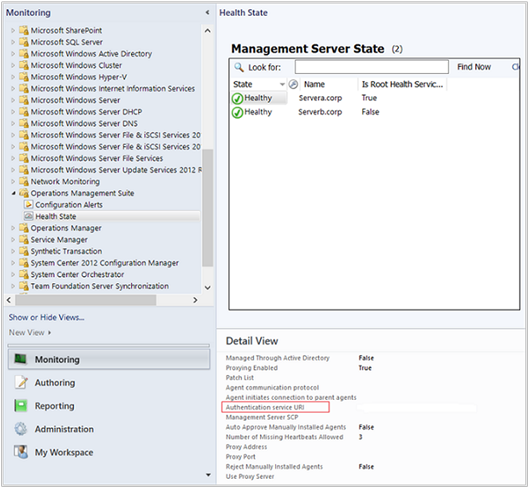 Proxy support was added in Operations Manager 2012 SP1 UR7 and Operations Manager 2012 R2 UR3. Integrating System Center Operations Manager 2016 with US Government cloud requires an updated Advisor management pack included with Update Rollup 2 or later. System Center Operations Manager 2012 R2 requires an updated Advisor management pack included with Update Rollup 3 or later. All Operations Manager agents must meet minimum support requirements. Ensure that agents are at the minimum update, otherwise Windows agent communication may fail and generate errors in the Operations Manager event log. A Log Analytics workspace. For further information, review Log Analytics workspace overview. You authenticate to Azure with an account that is a member of the Log Analytics Contributor role. Recent changes to Azure APIs will prevent customers from being able to successfully configure integration between their management group and Azure Monitor for the first time. For customers who have already integrated their management group with the service, you are not impacted unless you need to reconfigure your existing connection. This management pack update is not applicable to System Center Operations Manager 1807, which is an update release from version 1801 and not a full build of the product. The information below list the proxy and firewall configuration information required for the Operations Manager agent, management servers, and Operations console to communicate with Azure Monitor. Traffic from each component is outbound from your network to Azure Monitor. To insure the security of data in transit to Azure Monitor, we strongly encourage you to configure the agent and management group to use at least Transport Layer Security (TLS) 1.2. Older versions of TLS/Secure Sockets Layer (SSL) have been found to be vulnerable and while they still currently work to allow backwards compatibility, they are not recommended. For additional information, review Sending data securely using TLS 1.2. Perform the following series of steps to configure your Operations Manager management group to connect to one of your Log Analytics workspaces. During initial registration of your Operations Manager management group with a Log Analytics workspace, the option to specify the proxy configuration for the management group is not available in the Operations console. The management group has to be successfully registered with the service before this option is available. To work around this, you need to update the system proxy configuration using Netsh on the system your running the Operations console from to configure integration, and all management servers in the management group. Open an elevated command-prompt. a. Go to Start and type cmd. b. Right-click Command prompt and select Run as administrator**. After completing the following steps to integrate with Azure Monitor, you can remove the configuration by running netsh winhttp reset proxy and then use the Configure proxy server option in the Operations console to specify the proxy or Log Analytics gateway server. In the Operations Manager console, select the Administration workspace. Expand the Operations Management Suite node and click Connection. Click the Register to Operations Management Suite link. On the Operations Management Suite Onboarding Wizard: Authentication page, enter the email address or phone number and password of the administrator account that is associated with your OMS subscription, and click Sign in. The Operations Management Suite name has been retired. After you are successfully authenticated, on the Operations Management Suite Onboarding Wizard: Select Workspace page, you are prompted to select your Azure tenant, subscription, and Log Analytics workspace. If you have more than one workspace, select the workspace you want to register with the Operations Manager management group from the drop-down list, and then click Next. Operations Manager only supports one Log Analytics workspace at a time. The connection and the computers that were registered to Azure Monitor with the previous workspace are removed from Azure Monitor. On the Operations Management Suite Onboarding Wizard: Summary page, confirm your settings and if they are correct, click Create. On the Operations Management Suite Onboarding Wizard: Finish page, click Close. After configuring integration with your Log Analytics workspace, it only establishes a connection with the service, no data is collected from the agents reporting to your management group. This won’t happen until after you configure which specific agent-managed computers collect log data for Azure Monitor. You can either select the computer objects individually or you can select a group that contains Windows computer objects. You cannot select a group that contains instances of another class, such as logical disks or SQL databases. Open the Operations Manager console and select the Administration workspace. Click the Add a Computer/Group link under the Actions heading on the right-side of the pane. In the Computer Search dialog box, you can search for computers or groups monitored by Operations Manager. Select computers or groups to onboard to Azure Monitor, click Add, and then click OK.
You can view computers and groups configured to collect data from the Managed Computers node under Operations Management Suite in the Administration workspace of the Operations console. From here, you can add or remove computers and groups as necessary. Perform the following steps if an internal proxy server is between the management group and Azure Monitor. These settings are centrally managed from the management group and distributed to agent-managed systems that are included in the scope to collect log data for Azure Monitor. This is beneficial for when certain solutions bypass the management server and send data directly to the service. Expand Operations Management Suite, and then click Connections. In the OMS Connection view, click Configure Proxy Server. On Operations Management Suite Wizard: Proxy Server page, select Use a proxy server to access the Operations Management Suite, and then type the URL with the port number, for example, http://corpproxy:80 and then click Finish. If your proxy server requires authentication, perform the following steps to configure credentials and settings that need to propagate to managed computers that reports to Azure Monitor in the management group. Under RunAs Configuration, select Profiles. Open the System Center Advisor Run As Profile Proxy profile. In the Run As Profile Wizard, click Add to use a Run As account. You can create a Run As account or use an existing account. This account needs to have sufficient permissions to pass through the proxy server. To set the account to manage, choose A selected class, group, or object, click Select… and then click Group… to open the Group Search box. Search for and then select Microsoft System Center Advisor Monitoring Server Group. Click OK after selecting the group to close the Group Search box. Click OK to close the Add a Run As account box. Click Save to complete the wizard and save your changes. The Run As Account Microsoft.SystemCenter.Advisor.RunAsAccount.Certificate is created. It is associated with the Run As profile Microsoft System Center Advisor Run As Profile Blob and is targeting two classes - Collection Server and Operations Manager Management Group. Two connectors are created. The first is named Microsoft.SystemCenter.Advisor.DataConnector and is automatically configured with a subscription that forwards all alerts generated from instances of all classes in the management group to Azure Monitor. The second connector is Advisor Connector, which is responsible for communicating with Azure Monitor and sharing data. Agents and groups that you have selected to collect data in the management group is added to the Microsoft System Center Advisor Monitoring Server Group. Microsoft.SystemCenter.Advisor.MPUpdate - Updates the base Azure Monitor management packs. Runs every 12 hours by default. Microsoft.SystemCenter.Advisor.Core.GetIntelligencePacksRule - Updates solution management packs enabled in your workspace. Runs every five (5) minutes by default. You can override these two rules to either prevent automatic download by disabling them, or modify the frequency for how often the management server synchronizes with Azure Monitorto determine if a new management pack is available and should be downloaded. Follow the steps How to Override a Rule or Monitor to modify the Frequency parameter with a value in seconds to change the synchronization schedule, or modify the Enabled parameter to disable the rules. Target the overrides to all objects of class Operations Manager Management Group. To continue following your existing change control process for controlling management pack releases in your production management group, you can disable the rules and enable them during specific times when updates are allowed. If you have a development or QA management group in your environment and it has connectivity to the Internet, you can configure that management group with a Log Analytics workspace to support this scenario. This allows you to review and evaluate the iterative releases of the Azure Monitor management packs before releasing them into your production management group. In the Azure portal, click More services found on the lower left-hand corner. In the list of resources, type Log Analytics. As you begin typing, the list filters based on your input. Select Log Analytics and then create a workspace. Open the Operations Manager console with an account that is a member of the Operations Manager Administrators role and select the Administration workspace. Expand Log Analytics, and select Connections. Select the Re-configure Operation Management Suite link on the middle-side of the pane. Follow the Log Analytics Onboarding Wizard and enter the email address or phone number and password of the administrator account that is associated with your new Log Analytics workspace. The Operations Management Suite Onboarding Wizard: Select Workspace page presents the existing workspace that is in use. There are a few different ways you can verify that Azure Monitor to Operations Manager integration is successful. In the Azure portal, click More services found on the lower left-hand corner. In the list of resources, type Log Analytics. As you begin typing, the list filters based on your input. In your list of Log Analytics workspaces, select the applicable workspace. Select Advanced settings, select Connected Sources, and then select System Center. In the table under the System Center Operations Manager section, you should see the name of the management group listed with the number of agents and status when data was last received. Select Management Packs and in the Look for: text box type Advisor or Intelligence. Depending on the solutions you have enabled, you see a corresponding management pack listed in the search results. For example, if you have enabled the Alert Management solution, the management pack Microsoft System Center Advisor Alert Management is in the list. From the Monitoring view, navigate to the Operations Management Suite\Health State view. Select a Management server under the Management Server State pane, and in the Detail View pane confirm the value for property Authentication service URI matches the Log Analytics Workspace ID. When you no longer require integration between your Operations Manager management group and the Log Analytics workspace, there are several steps required to properly remove the connection and configuration in the management group. The following procedure has you update your Log Analytics workspace by deleting the reference of your management group, delete the Azure Monitor connectors, and then delete management packs supporting integration with the service. Management packs for the solutions you have enabled that integrate with Operations Manager and the management packs required to support integration with Azure Monitor cannot be easily deleted from the management group. This is because some of the Azure Monitor management packs have dependencies on other related management packs. To delete management packs having a dependency on other management packs, download the script remove a management pack with dependencies from TechNet Script Center. Open the Operations Manager Command Shell with an account that is a member of the Operations Manager Administrators role. Verify you do not have any custom management packs with the word Advisor or IntelligencePack in the name before proceeding, otherwise the following steps delete them from the management group. To remove any management packs remaining which have a dependency on other System Center Advisor management packs, use the script RecursiveRemove.ps1 you downloaded from the TechNet Script Center earlier. The step to remove the Advisor management packs with PowerShell will not automatically delete the Microsoft System Center Advisor or Microsoft System Center Advisor Internal management packs. Do not attempt to delete them. Open the Operations Manager Operations console with an account that is a member of the Operations Manager Administrators role. In the Azure portal, click the Settings tile. In the table under the System Center Operations Manager section, you should see the name of the management group you want to remove from the workspace. Under the column Last Data, click Remove. The Remove link will not be available until after 14 days if there is no activity detected from the connected management group. A window will appear asking you to confirm that you want to proceed with the removal. Click Yes to proceed. The computer you run this script from, if not a management server, should have the Operations Manager command shell installed depending on the version of your management group. # Configures a connector with the specified name. # Removes a connector with the specified name. On the source media under the \ManagementPacks folder for System Center 2016 - Operations Manager and higher. From the most recent update rollup applied to your management group. For Operations Manager 2012, the source folder is %ProgramFiles%\Microsoft System Center 2012\Operations Manager\Server\Management Packs for Update Rollups and for 2012 R2, it is located in System Center 2012 R2\Operations Manager\Server\Management Packs for Update Rollups. To add functionality and gather data, see Add Azure Monitor solutions from the Solutions Gallery.